The First Trailer & Poster For Lynne Ramsey's 'WE NEED TO TALK ABOUT KEVIN' Starring Tilda Swinton. Lynne Ramsay’s adaptation of Lionel Shriver’s excellent novel We Need to Talk About Kevin has a new trailer & poster [via BleedingCool] Tilda Swinton & John C. Reilly star in the film based around a mother’s struggling relationship with her sociopathic son & the aftermath of her son's involvement in a high school tragedy. The film hits theaters this December 2nd. Hit the jump to check out the trailer & poster. Book Synopsis: "Two years ago, Eva Khatchadourian's son, Kevin, murdered seven of his fellow high-school students, a cafeteria worker, and a popular algebra teacher. Because he was only fifteen at the time of the killings, he received a lenient sentence and is now in a prison for young offenders in upstate New York. Telling the story of Kevin's upbringing, Eva addresses herself to her estranged husband through a series of letters. Fearing that her own shortcomings may have shaped what her son has become, she confesses to a deep, long-standing ambivalence about both motherhood in general and Kevin in particular. How much is her fault? Lionel Shriver tells a compelling, absorbing, and resonant story while framing these horrifying tableaux of teenage carnage as metaphors for the larger tragedy - the tragedy of a country where everything works, nobody starves, and anything can be bought but a sense of purpose." 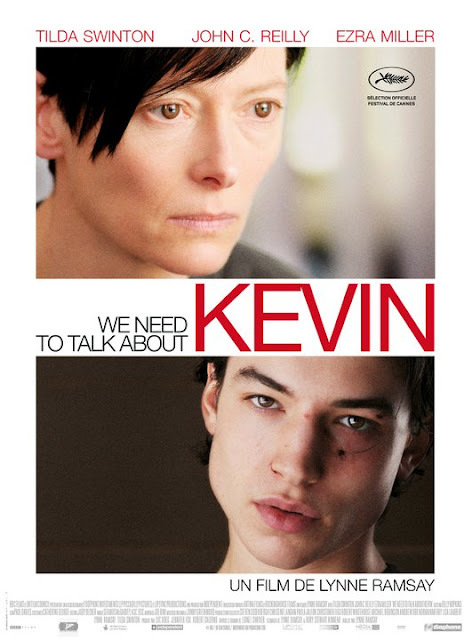 I'm reading: The First Trailer & Poster For Lynne Ramsey's 'WE NEED TO TALK ABOUT KEVIN' Starring Tilda Swinton.Tweet this!